*You will be signed up to receive monthly updates. Why is it so hard to scale a company and keep it growing? Much of what we believe about what it takes to scale a successful company and keep it growing is just plain wrong. Most of the advice handed out by the business press and consulting firms simply doesn’t address the real challenges involved in navigating the unforgiving terrain that lies between a promising business and a market leading enterprise. Growing a business to scale is difficult and risky. Leading a fast-growing company can seem a lot like traveling through uncharted territory. The right path may not always be clear. You need to know what lies ahead, beyond the horizon. You need the insight of others who have successfully traveled the same path. 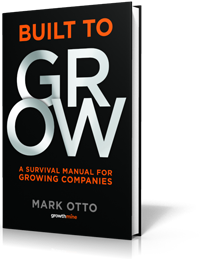 This eBook details how successful companies actually grow over time and the strategies, skills, and capabilities necessary to anticipate and manage the inherent challenges companies face as they grow and scale. So no matter which stage your business is in — from small company to industry leader — you’ll be able to address the most important issues, needs, and priorities at every pivotal point of your organization’s growth. Understand what a leadership team must do to achieve scalable, sustainable growth. Discover why growth is more than a strategy. Learn how to anticipate and plan for how growth will impact your organization. Know when to adapt your methods and management approach to effectively manage growth.